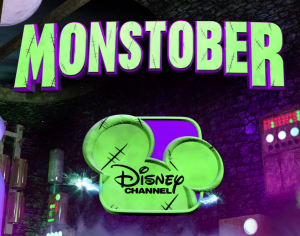 Disney Channel stars Raini Rodriguez and Calum Worthy (from the hit series “Austin & Ally”) will host “Monstober,” Disney Channel’s month-long Halloween celebration dedicated to all things spooky fun. Beginning Tuesday, October 1st 2013, this year’s highlights include the season three premiere of “Jessie,” premiere of the thrilling series “Wolfblood,” new “Gravity Falls” short-form series “Dipper’s Guide to the Unexplained,” an ‘ear-raising’ episode of the cartoon short “Mickey Mouse,” and a special one-hour episode of “Marvel’s Ultimate Spider-Man,” guest starring Ross Lynch (“Austin & Ally,” “Teen Beach Movie”). Popular series “A.N.T. Farm,” “Dog With a Blog,” “Good Luck Charlie,” “Liv and Maddie,” “Phineas and Ferb,” “Shake It Up,” and “Wander Over Yonder” will feature all-new bone-chilling episodes. Rounding out the month is a marathon of fan-favorite Halloween movies, including “Girl Vs. Monster,” “Halloweentown,” “Twitches,” “My Babysitter’s A Vampire,” and more, and the “Monstober” premiere of Disney-Pixar’s special “Toy Story of TERROR!” on Friday, October 25th 2013 at 8:00pm ET. 8:00pm ET – “Wolfblood” The entire first season will air throughout “Monstober” every Tuesday, Wednesday and Thursday night at 8:00 p.m., October 1 – 24. The mutants are back for Halloween and this time they arrive at what they think is a new boarding school for monsters, only to discover it’s actually a prison run by Winter. When they try to escape, they accidently open a portal to the A.N.T. boarding school and meet the human versions of themselves. Enjoying their newfound freedom, the mutants trick Chyna and the gang through the portal to take their places back in the mutant world. It’s Halloween at the James-Jennings house and everyone looks to Avery to plan the family party. However, when Avery finds out that all of her friends, including her crush Wes, are going to a classmate’s house Halloween night, she wants to skip the family’s party and be with her friends. Meanwhile, Stan sets out to find the perfect costume that will disguise that he’s a dog so that he can attend the party and converse with Ellen and Bennett. Guest starring Peyton Meyers (of Disney Channel’s “Girl Meets World”) as Wes. When Mickey’s car breaks down in a spooky forest, a Goofy-looking ghoul gives chase to everyone’s favorite mouse. When Wander and Sylvia board an abandoned spaceship, they encounter a horrifying alien monster that is set on eating them. While Sylvia sees the wild beast as a threat, Wander takes a liking to the ferocious little monster and tries to train it to be his pet. When Vanessa learns that Doofenshmirtz has inherited a Drusselsteinian castle right next door to her she seizes the opportunity to throw the biggest Halloween bash ever. The whole town is there, including Phineas and Ferb, who act as the event’s party planners and DJs. Meanwhile, Doofenshmirtz enlists Perry to help him find a large, hidden treasure that his Great Aunt has placed somewhere within the castle. When Mrs. Chesterfield throws a roof-top bash and doesn’t invite Jessie and the kids, they decide to throw a Halloween party themselves. But their festivities take a haunting turn when Jessie begins to see ghosts and Emma, Luke and Mrs. Chesterfield are overcome by ghoulish spirits. Now, it’s up to Jessie, Ravi and Zuri to defeat the ghosts and save the day and the building. This new episode of “Phineas and Ferb” features three separate tales. Tale One follows Candace as she accidentally conjures up a spell that turns her Ducky Momo plushie into a living, breathing doll that is set on stalking her. In Tale Two, Doofenshmirtz encounters a mythological, giant floating baby head that grants cursed wishes; and Tale Three pits Phineas, Ferb and their friends against a horde of mischievous, evil platypuses set on destroying the town. It’s Halloween for Marvel’s Ultimate Spider-Man, but there’s no time for Spider-Man and his friends to trick-or-treat when they find themselves attacked by evil vampires led by Dracula himself. Spidey’s only hope of stopping a world takeover is to team up with Nick Fury’s secret team of super-powered monsters, The Howling Commandos. Led by Jack Russell, aka Werewolf by Night, The Howling Commandos include vampire hunter Blade, The Living Mummy, Frankenstein’s Monster and Man-Thing. Guest starring are Ross Lynch (“Austin & Ally”) as Jack Russell aka Werewolf by Night, Terry Crews (“Everybody Hates Chris”) as Blade, Oded Fehr (“The Mummy”) as The Living Mummy, Kevin Michael Richardson (Disney XD’s “Randy Cunningham: 9th Grade Ninja”) as Frankenstein’s Monster and Cory Burton (Disney Junior’s “Jake and the Never Land Pirates”) as Dracula. Teddy and her friends go ‘Halloween Caroling’ to raise money for the drama club. Meanwhile, PJ and Gabe’s plans for a simple night turn creepy after a neighboring mom promises to get even with them for not giving her son any trick-or-treat candy. When Joey is too nervous to talk to a girl he likes, Maddie decides the best place for him to practice talking to girls is at the high school dance – when everyone is in costume. Meanwhile, Parker booby-traps the house to protect one of the family’s most prized Halloween decorations from being stolen. Rocky and CeCe decide they’re too old to trick-or-treat and elect to have a “Mature-o’ween” with more adult activities, such as knitting and watching tear-jerking movies. They soon realize they’re just missing out on fun and candy, and scramble to salvage what’s left of their Halloween. Meanwhile, tired of being treated like a little kid, Flynn challenges Ty and Deuce to a scare off in an old abandoned house believed to be haunted by a young spirit. After studying hours of horror movies, Doofenshmirtz develops a theory that enlarging small, cute animals into giant beasts will help him take over the Tri-State area. But when he puts his plan into action, he soon realizes it might be too much for him to handle. Meanwhile, Phineas and Ferb make a giant revolving foam city so they can safely perform skateboarding tricks, and Candace’s tour of the Danville Space Laboratory gives her an opportunity for a high-tech bust. New shorts premiere each night the week of October 14- 18 at 7:25pm ET. The new short-form series kicks-off the week with two back-to-back episodes, “Candy Monster” (7:25 p.m.) and “Stan’s Tattoo” (7:55 p.m.). In “Candy Monster,” Dipper and Mable must go into full on battle mode against a mysterious creature when it leaps out of the rafters and steals their ‘Summerween’ candy. “Stan’s Tattoo” follows Dipper as he devises a plan to unravel the enigma that is Stan’s Tattoo. Dipper and Soos stumble upon a mailbox in the middle of the forest and make it their mission to discover who (or what) picks up the mail left inside. Dipper sets out to discover why a certain Gravity Falls resident always faces left. Dipper and Mabel find a gigantic tooth on the shores of the lake, and set out in a rowboat to find out where it came from. In hearing of a local lumberjack legend, Dipper investigates a mysterious creature that has been heard, but never seen. What starts out as a fun road trip for the “Toy Story” gang takes an unexpected turn for the worse when the trip detours to a roadside motel. After one of the toys goes missing, the others find themselves caught up in a mysterious sequence of events that must be solved before they all suffer the same fate. 4:00pm to 10:00pm ET – Marathon featuring encore presentations of Halloween-themed episodes.